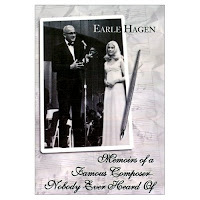 In his autobiography, "Memoirs of a Famous Composer -- Nobody Ever Heard Of," Hagen wrote that while sitting at home "wracking my brain for an idea for a theme for the Griffith show, it finally occurred to me that it should be something simple, something you could whistle. With that in mind, it took me about an hour to write the Andy Griffith theme." Hagen was also the composer of the moody and noirish Harlem Nocturne, a jazz and big band staple that has been covered at least 500 times, according to WFMU's Beware of the Blog. WFMU offers 42 versions of Hagen's classic as a tribute, including interpretations by TTRH favorites Johnny Otis; Illinois Jacquet; Louis Prima; and Boots Randolph. Recommended is Mel Torme's silky take on the seldom-heard lyrics.